The Hub and I were on a closet-cleaning binge recently. These binges seem to strike in the winter, when we manage to get bored enough to actually see cleaning as a fun activity. We spent some time mulling over how many editions of Monopoly we really need before ending up keeping them all, from the original through British, San Francisco and Star Wars versions. Then we found a small deck of playing cards. Boy, would these cards make a poker game a downer. 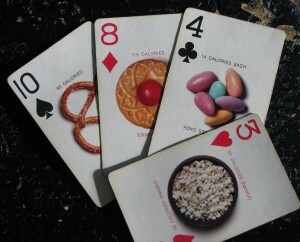 Each card has a photograph of a snack food along with the calorie count. I might drop my royal flush if I noticed that the seven cashews I just ate were 115 calories. And of course one only eats seven cashews. There’s pretzels, popcorn, caramels, potato chips (one, 11 calories). A petit four for the queen, a delicate 95 calories. The backs are a pattern of pill capsules. The Hub recognized the cards immediately. His father was a doctor, and drug reps would leave all kinds of promotional trinkets. 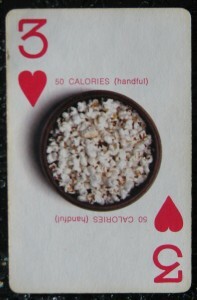 The cards, called an Eska-Deck, were produced in 1969 for SmithKline & French, which later merged with GlaxoSmithKline. Because of the deck’s name, I’m wondering if it was intended to promote SKF’s late-1960s diet drug Eskatrol. According to what I could find online, the drug, an amphetamine, was removed from the market in the early ’80s by the FDA, but not before it found its way into a Jimmy Buffett song. : “Get a bottle of rum and an Eskatrol and watch the same thing happen to you.” – “Fool Button,” Son of a Son of a Sailor, 1978. The very same album also includes “Cheeseburger in Paradise,” which brings us all the way back around to food. But none of the Eska-Deck cards include a burger. Fortunately. There are so many Southern-themed cookbooks out now. And while the bigger cookbook world just discovered my native chow, some writers have been carrying the torch for years. One such author is Jean Anderson, whose 2007 book “A Love Affair with Southern Cooking” is full of heart, soul and history. Now Anderson, who lives in Chapel Hill, N.C., opens the door to Southern-style baking with “From a Southern Oven: The Savories, the Sweets” (John Wiley & Sons, $32.50). The book contains recipes for casseroles with Southern touches, like Orange Chicken Nested in Pecan Pilaf, and plenty of crab and seafood dishes. Anderson always finds at least one recipe with a history that surprises. One in this book is Philpy, a quick bread made in the South Carolina Lowcountry using cooked rice and rice flour. Then there’s Confederate Rice Pudding, from the same part of the world, which includes Madeira. I love sweet potatoes, and am pleased to see several enticing recipes using them, including Sweet Potato Focaccia, Sweet Potato Corn Bread and Bourbon-Glazed Sweet Potato Pound Cake. Anderson has written more than a dozen cookbooks, and is a food writing professional whose recipes always work; you can rely on them. She has long been my role model in that area. Others may be jumping on the Southern cookbook bandwagon, but they will have to ride a long way to catch up with Anderson. What started as one competition to draw diners to restaurants in Blowing Rock has grown to four tilts scattered across the state. You can read more about them here. Besides cooking for professional judges, of which I was one last night, they also serve more than 100 ticket holders. 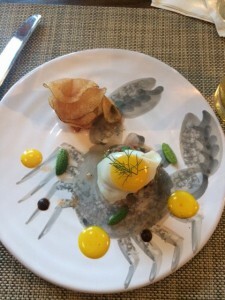 The dishes are blind tasted, and can be anything the chefs choose, from appetizer to dessert. Winners are determined by scores on presentation, aroma, flavor, accompaniments, secret ingredient creativity and execution. The scores are weighted 70 percent on the public’s evaluations and 30 percent on the professional judges’ marks. The plan is for the winners of the four Fire competitions to vie for an overall title, but not date has been set. 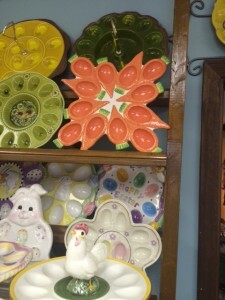 Past ingredients for Fire in the Triangle have included blueberries, noodles and wontons, beef, cantaloupe and turkey. Monday night’s: Fresh corn from John Hudson Farms in Newton Grove. The interesting thing about these kinds of contests is seeing the creativity that talented chefs can show when focusing on one ingredient. These were professionals, so every dish was going to be good. But my question throughout: Does this dish make corn the star of the show or relegate it to the back of the chorus? For me, the winning dishes brought corn forward to take a bow while still playing well with complimentary flavors in a cohesive dish. The desserts were good illustrations of what I’m talking about. One was a firm rectangle of cool corn custard that was sweet but had a strong fresh corn flavor. It was topped with a caramel made from Pepsi, graham cracker crumble and peanuts. The caramel, crumble and peanuts danced with the corn, bringing out the flavor. There was no question this dessert was about corn. In contrast, the other dessert was delicious, but it didn’t tell a story of corn as well. It was a sweet, crunchy tuile made from corn which held a whipped corn cream and was garnished with blueberries, peaches and a corn creme anglaise. For all that corn in the dish, I didn’t get a strong corn flavor (I could only taste the sugar in the tuile, no corn at all). I found out later that Childers made the custard and Falcoz-Vigne the other dessert. The winner was Childers, who will go on to compete against the winner of The Oxford vs. Flights contest tonight. My neighbor has been raving about a cookbook for some time. However, it’s not one of mine. 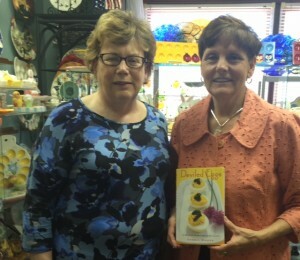 It’s “The New Southern Garden Cookbook” by Chapel Hill’s Sheri Castle (UNC Press, 2011). My neighbor has other fine qualities, so I have chosen to overlook his lack of tact. It’s difficult to blame him, and we are into the time of year that this book is really useful, because it offers many ways with Southern vegetables. For example, I had a load of chard from my CSA box. Sauteed greens with some garlic is great, but I wanted something different. The Greens section of the book offered many tempting options. I went with Greek Shrimp with Spinach, Feta and Orzo – with some modifications, starting with the chard for the spinach. I omitted the Parmesan cheese and used only half of the feta called for, a nod to The Hub’s dairy allergy. I could not find orzo in my usual supermarket, but I did find a box of the cutest miniature bow-tie pasta, called farfarlline. So, this is an adaptable recipe, obviously. It even tastes pretty good reheated the next day (do it gently, so as not to rubberize the shrimp). And it’s hard to argue with my neighbor. Preheat the oven to 400 degrees. 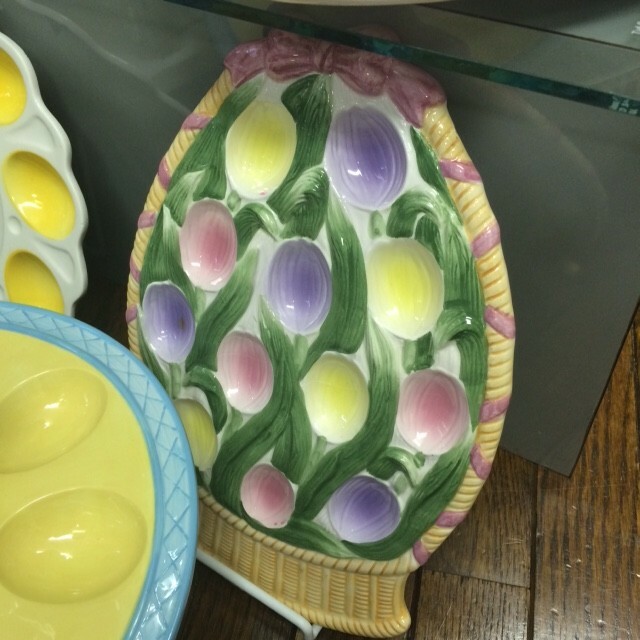 Brush a glass or ceramic 9×13-inch baking dish with 1 tablespoon of the oil. cook the orzo according to package directions. Drain well in a colander and return to the same pot. Stir in 3 tablespoons of the oil, the spinach, 1/2 cup of the feta and the Parmesan. Spread the orzo mixture in the bottom of the prepared baking dish an dcover with foil to keep warm. Heat 1 tablespoon of the oil in a large skillet over medium-high heat. Add the shrimp and cook only until they start to turn opaque, about 1 minute. The shrimp will finish cooking in the oven. Arrange the shrimp over the orzo. Heat the remaining 2 tablespoons of oil in the skillet. Add the garlic and cook until you can smell the aroma, about 30 seconds. Stir in the tomatoes, wine, oregano and red pepper flakes. Simmer uncovered, stirring occasionally, until the mixture reduces to the consistency of pasta sauce, about 5 minutes. Stir in the parsley. Season with salt and pepper. Spoon the sauce over the shrimp and orzo. Bake until the shrimp are opaque, about 10 minutes. Sprinkle with the remaining 1 cup of feta cheese and serve hot. No swimsuit competition. No earnest speeches about saving baby whales. 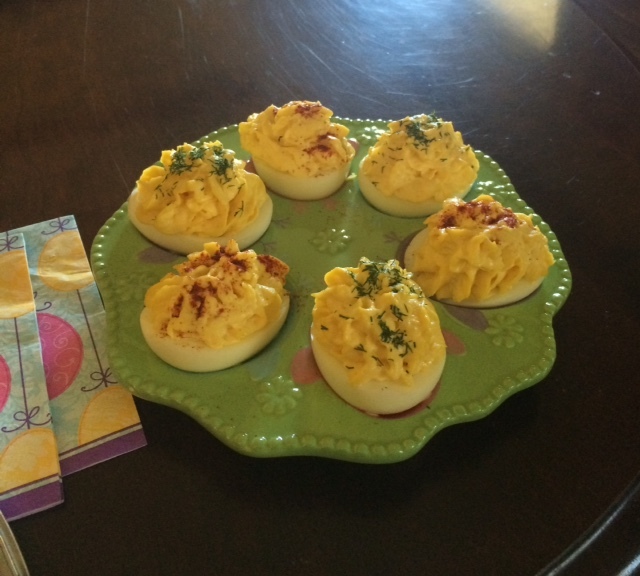 Just deviled eggs – and beverages. Emerson Beyer and Michael Bruno in Durham invited me to be a judge for for their Deviled Egg Pageant, and how could I resist? Especially since money from tickets to the party and pageant went to Urban Ministries in Durham. The pageant started three years ago as part of a party in their backyard. This year, as part of the fundraising, it was moved to a downtown space and opened to professional chefs as well, and raised around $1,500. Entrants – 20 in all – were asked to pair deviled eggs with suitable beverages, then add creativity to secure the coveted white satin sash. Creativity, as with Miss Steph laPod: deviled eggs containing octopus. Miss Southern Hospitality went the classic Southern route, with a matching lemony iced tea. Other judges were Amy Tornquist, chef of Watts Grocery in Durham; Andrea Weigl, food writer for The News & Observer; Stuart White of Bluebird Meadows Farm and Noah Ranells of Fickle Creek Farm, plus Emerson and Bruno. I paired up for judging with Tornquist, dividing egg halves between us for judging. 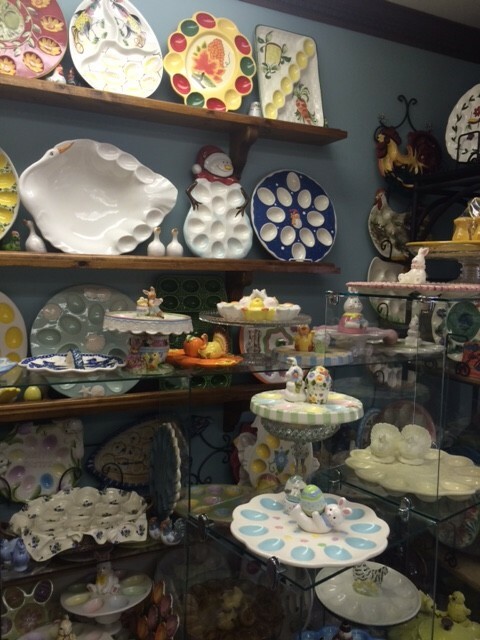 Twenty is a lot of deviled eggs, let me tell you, and you’ve got to pace yourself. We had standards, and we showed no mercy. Tornquist said of one that included too much sweet pepper jelly that it was “what a Yankee would think a deviled egg is.” Neither of us could handle the deviled eggs topped with Peeps. We gave the person who made meringues shaped like eggs with a lemon sauce points for wit – but those were not deviled eggs. But there were enough standout examples of high deviled-egg art that there was a lively discussion among all the judges as to the winners in the amateur and professional categories. First place in the amateur category went to Miss Smoke and Fire by Andrew and Meaghan Hutson of Durham, which included eggs with Benton’s bacon and a bourbon margarita. Other winners were Miss Vichy, topped with crunchy fried leeks; and Miss Smoky. The professional category was taken by Miss Pickled Pink by Phoebe Lawless of Scratch Baking, which involved beets. The People’s Choice, determined by guests’ votes, was Miss Fermentation Sensation, three flavors of pickled-and-stuffed eggs.